“Kiss The Bride” Wedding Contest Winner! 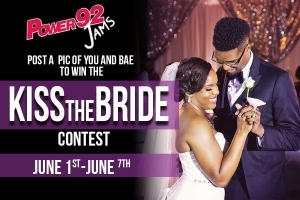 It’s wedding season and Power 92 Jams is coming to the rescue! We’re giving a way a certificate for a cake, flowers, and tickets to the “Kiss the Bride” expo for ONE lucky grand prize winner! Is it you? 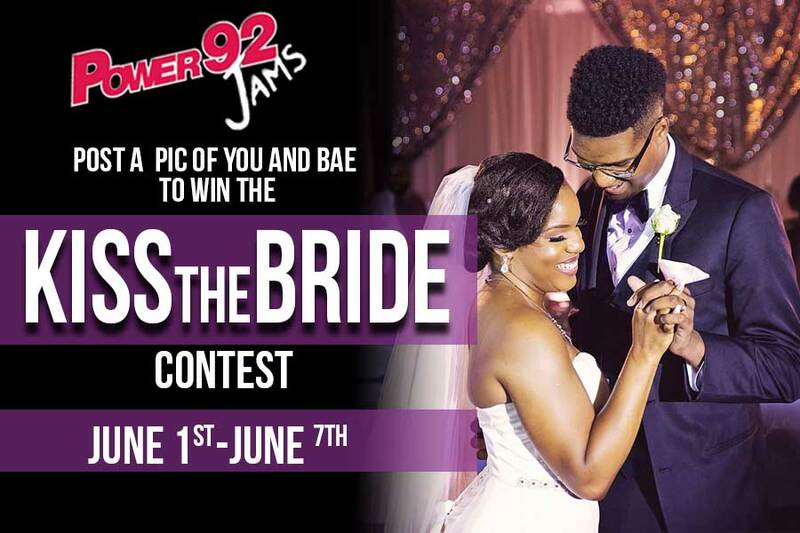 Enter to win on our Facebook Page by submitting a picture of you and your mate under the “Kiss The Bride” post! We will announce the official winner on Friday, June 8th! Check out the full details below! Good luck! A complete copy of these rules can be obtained at the offices of radio station KIPR (“Station”), 700 Wellington Hills Rd, Little Rock, Ar 72211, during normal business hours Monday through Friday or by sending a self-addressed, stamped envelope to the above address. Eligibility. This Contest is open only to legal U.S. residents, excluding Florida and New York residents, age eighteen (18) years at the time of entry with a valid Social Security number and who reside in the Station’s Designated Market Area (“DMA”) as defined by Nielsen Audio, who have not won a prize from the Station in the last thirty days or a prize valued at $500 or more in the last ninety days, and whose immediate family members or household members have not won a prize from the Station in the last thirty days or a prize valued at $500 or more in the ninety days Void where prohibited by law. Employees of Cumulus Media Holdings Inc., its parent company, affiliates, related entities and subsidiaries, promotional sponsors, prize providers, advertising agencies, other radio stations serving the Station’s DMA, and the immediate family members and household members of all such employees are not eligible to participate. The term “immediate family members” includes spouses, parents and step-parents, siblings and step-siblings, and children and stepchildren. The term “household members” refers to people who share the same residence at least three (3) months out of the year. The Contest is subject to all applicable federal, state and local laws and regulations. Participation constitutes entrant’s full and unconditional agreement to these Official Rules and Station’s decisions, which are final and binding in all matters related to the Contest. Winning a prize is contingent upon fulfilling all requirements set forth herein. 2. Contest Period. The Contest will begin at 12:01a.m., CST on June 1, 2018 and will run through 11:59 p.m., CST on June 7, 2018_ (the “Contest Period”). The Station’s computer is the official time keeping device for this Contest. material(s) which may infringe upon any person or entities proprietary rights, as determined in the sole discretion of the Station, will be disqualified. 4. Winner Selection. On or about 9:00 am CST on Friday, June, 8 2018, Station will select one (1) entry for the Grand Prize. The winner will be selected based on the amount of likes they receive on their uploaded photo to the Power 92 Facebook fan page. The winning entrant will be contacted using the email address and/or telephone number provided with the entry and may be awarded the prize (subject to verification of eligibility and compliance with the terms of these rules). Station’s decisions as to the administration and operation of the Contest and the selection of the potential winner are final and binding in all matters related to the Contest. Failure to respond to the initial verification contact within three (3) days of notification will result in disqualification. 6. PRIZE. One (1) Grand Prize will be awarded in this Contest. The Grand Prize is Kiss The Bride Package: Wedding Cake Valued at $500.00, Fairytales Floral valued at $500.00 and tickets to Kiss the Bride Expo valued at $96.00 (Grand Prize Value: One Thousand Ninety-Six Dollars ($1,096.00)). Winner is responsible for all taxes associated with prize receipt and/or use. Odds of winning the Grand Prize depend on a number of factors including the number of eligible entries received during the Contest Period and listeners participating at any given time. software; (3) unauthorized human intervention in any part of the entry process or the Contest; (4) technical or human error which may occur in the administration of the Contest or the processing of entries; or (5) any injury or damage to persons or property which may be caused, directly or indirectly, in whole or in part, from entrant’s participation in the Contest or receipt or use, non-use or misuse of any prize. No more than the stated number of prizes will be awarded. In event that a production, technical, programming or other error causes more than stated number of prizes as set forth in these Official Rules to be claimed, Station reserves the right to award only the stated number of prizes by a random drawing among all legitimate, unawarded, eligible prize claims. CONTEST SPONSOR: Cumulus Radio Corporation, KIPR 700 Wellington Hills Rd, Little Rock, Ar 72211.